More than half of all email is now opened on a mobile device. That means customers appreciate emails that deliver more information — and require less scrolling. Enter notification-style emails. From order confirmations to breaking news alerts and beyond, we’re helping brands extend the things customers love about mobile communications (real-time, hyper-relevant and personalized) to email. Create, schedule, deploy and orchestrate notification-style emails alongside all your mobile and web in one place. Apply sophisticated orchestration and optimization solutions so every email is more personalized, coordinated, and relevant. Upload custom HTML directly into the email composer — or use our pre-built templates for even faster deployment. Make emails more relevant and personalized with custom merge fields that will automatically fill in information from uploaded lists. Send personalized, lightning-fast email notifications that reach customers in real-time with custom event, tag, and first seen triggers — so every email is more relevant and effective. 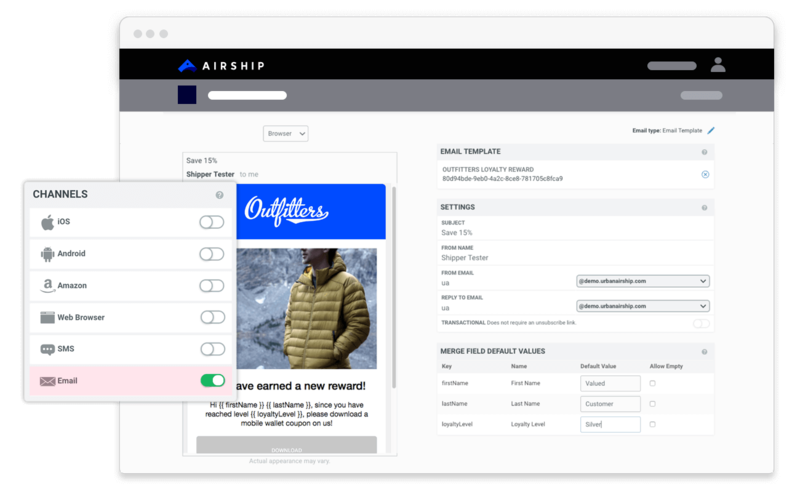 Email notifications are just one way Airship’s powerful Customer Engagement Platform helps enterprise brands create massive value at every lifecycle stage. Let us show you what it can do for you.